A quick post showing the full outfit I wore to the IAMX show detailed in my previous entry. I threw this outfit together last minute knowing that I wanted something all black and comfortable. LOVE your dress, the bag is AMAZING! I love your dress it's so unique! i havde been wanting a dress like that forever! except in pastel colors. looks great on you babe! I love your hair! Pretty pictures. besos. Hello from the blog hop! 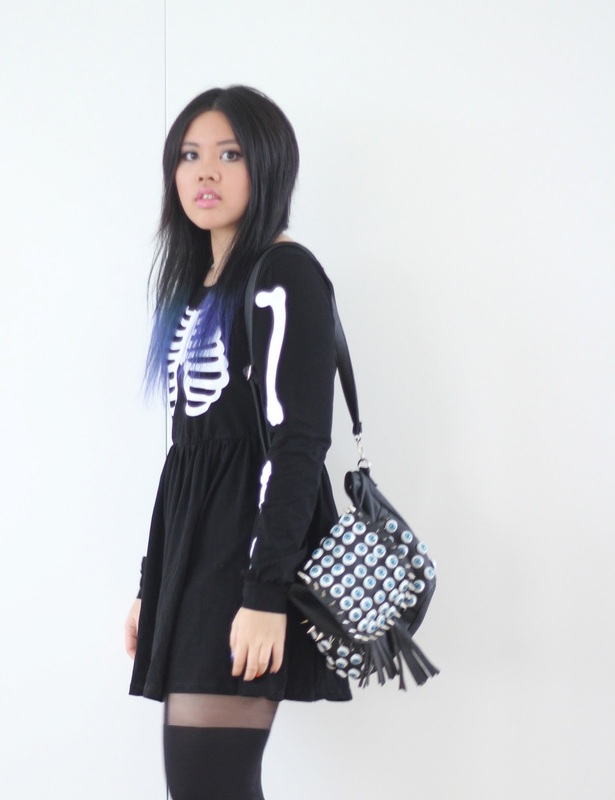 Love the skelly top - I've wanted one for so long! It's the inner goth in me! Great outfit, love the bag and tights! Love your dress!!! perfect for Halloween!!! hahaha!! x A.
I want that dress so badly :) you look amazing in it, so badass! Also, your last comment on my blog brought a little tear to my eye <3 I hope you know I feel exactly the same about you and your blog. Love love love! Cyber-hug!! first - we LOVE your style.. and second - your hair is aaaamzing! Hey hun, love your blog post . I'm looking forward to seeing your next post.. Will definitely follow you.. Could you check out my blog and give me any tips if you think necessary..